What do you get when you mix 40 cows, a Mississippi dairy farm family, and lots of determination and creativity? In the case of the Mauthe family, you get a recipe for success. That recipe starts with long hours for Kenny, a third-generation dairy farmer, his wife Jamie, and their daughters Sarah and Katie. Kenny begins the twice-a-day milking process at 4 a.m. Everyone jumps in to help with the other tasks from the processing and bottling of the milk to the creation and packaging of their cream, butter and cream cheese products. Then there’s sales and marketing and delivery. And, of course, the cows need to be fed and cared for. The hours are long, but the results are satisfying. “We try to produce a milk that is as natural as possible and retains its natural enzymes,” Kenny Mauthe says. “That way, consumers get a great taste and healthy final product. Plus, more people are looking to buy food that is locally grown. It’s a good feeling to know we can make that available to the public.” On-farm processing is a relatively new focus for the Mauthes. They began as a commercial dairy on 330 acres in the community of Progress near McComb 30 years ago. For nearly two decades, they milked between 80 and 180 cows a day and sold the raw product, but economics and a natural disaster changed that. Low milk prices in 2001 and Hurricane Katrina in 2005 forced them to be both creative and resilient. “We regrouped after Katrina, sold all but 50 acres of the farm, began renovations, and got our permit for processing in June 2010,” Jamie Mauthe says. Now, their 40 cows supply customers in a 100-mile radius with whole, two percent, skim and chocolate milk along with other products, including their specialty Creole cream cheese. They sell to retail stores and at local farmers markets. “We enjoy the farmers markets so much because you really get to meet your customers and build a relationship that is family-oriented,” Jamie Mauthe says. Sarah Mauthe packages homemade cheesecakes, one of the farm’s specialty products. 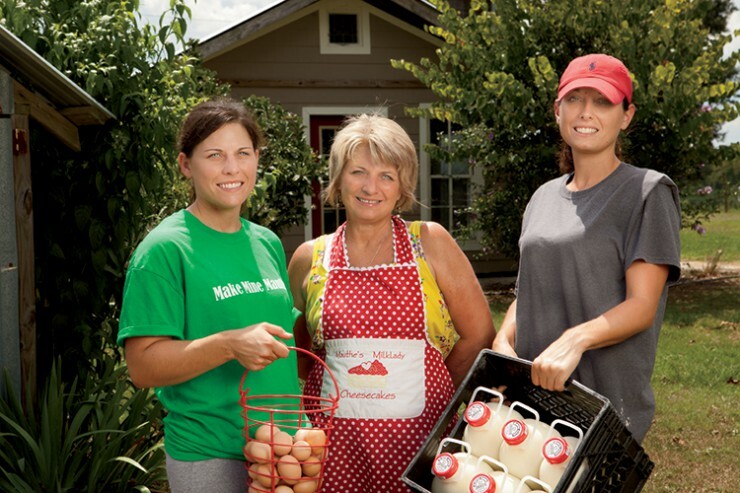 The Mauthe family farm is one of a handful of on-farm processing facilities in the state. 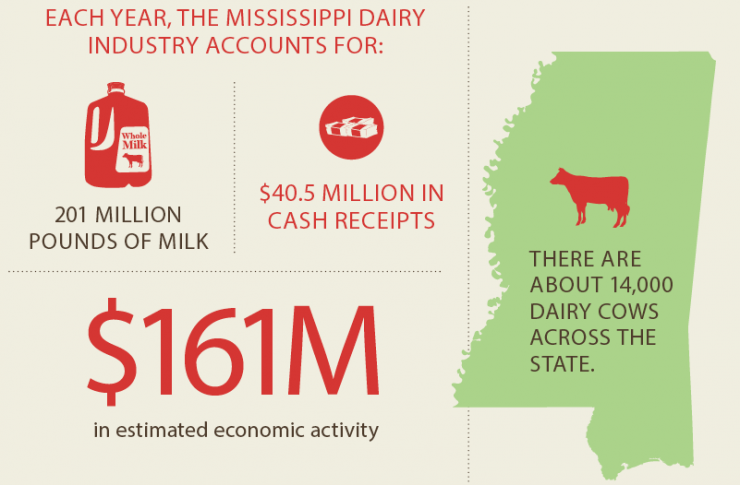 However, there are 95 grade A dairy farms in Mississippi. Most of them are south of Interstate 20, and all of them are family owned and operated, says Lamar Adams, a dairy specialist at Mississippi State University. “The footprint of the dairy industry isn’t as large as it was 30 years ago, but we continue to have a vital family dairy industry in the state,” Adams says. 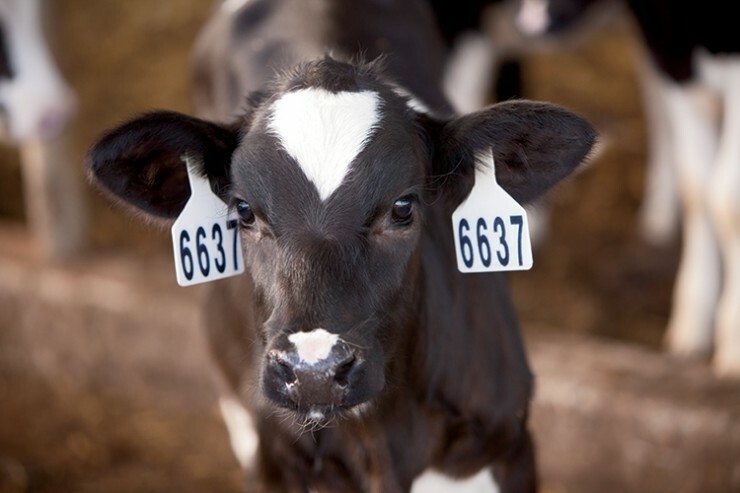 According to the most recent figures, the industry accounts for nearly 201 million pounds of milk, cash receipts of $40.5 million, and estimated economic activity of $161 million. All of that from about 14,000 dairy cows across the state. That’s a big impact, but it’s also a big job. The Mauthes were the winners of the Green America People & Planet Award in 2014 for their commitment to environmental responsibility. Their sustainable efforts include using glass returnable bottles to keep plastic out of the landfill; avoiding the use of pesticides and herbicides on their grazing land; and using whey, cow manure and fish oil as a natural fertilizer. With their award, the Mauthes purchased a small irrigation system so they could pump the water from their oxidation pond onto their field for an even “greener” operation.